Abrasive waterjet cutting technology is a great method for cutting glass because it allows for contours and shapes that cannot be achieved with other cutting machines at a reasonable cost. From artistic tabletop inlays to detailed stained glass designs, mirrors, glass ornaments, replacement windows for antique cars, and more, there’s almost no glass cutting application that a waterjet cutting machine from KMT Waterjet can’t tackle. Glass has a tendency to crack, so it is very important that the initial holes are produced with a reduced pressure of 7,200 PSI/500 bar to 11,600 PSI/800 bar. Subsequently, the pressure must be increased to a cutting speed that is cost-effective. For glass, ceramics and other brittle materials, you must gradually increase and reduce the cutting pressure by means of proportional pressure control of the intensifier pump, otherwise the material would be destroyed. As an alternative to quartz sand, olivine can be used as an abrasive because it is softer, which reduces the potential for chipping, cracking and other surface blemishes and leaves a cut edge that is polished to a smooth finish. 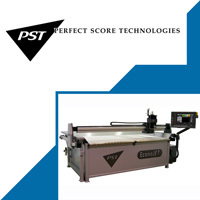 Because water jet cutting does not vibrate the glass, there is no heat-affected zones (HAZ), or leave behind rough edges, almost no secondary finishing is required. KMT offers global technical services network for support. 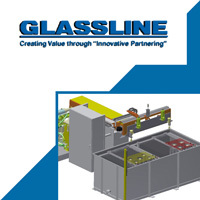 For over 45 years, Dependable Glass Works, Covington, LA, has provided customers innovative and cutting edge technology to create unique designs in glass. This one minute video offers a unique look at how waterjet technology can cut glass. Enjoy "The Waterjet Swirl Overture."